Works like a Topical Botox! WE ARE SEEING AMAZING RESULTS! AMAZING! Want to Try it for FREE! Our clients that have tried it and purchased it already, loved the results even after 1 use! So We have developed a Botox Results Facial Package, “Tightening, Lightening & Brightening, “where we will use the product in the facial package and we have made it a heavily discounted, triple benefit package, so you can see the results for yourself during your facial treatment before you take it home!! 100% of our clients that have tried it, purchased it! It’s amazing and exclusive to Great Skin! GoldTox T&T Neck & Decollate Creame! T&T (Tone & Tighten) Neck Creame with Apple Stem Cells to retard the aging process! Facial Package using Liquid GoldTox! It is formulated for you to use at home and incorporate with your Great Skin Skin Care regimen. We want to prove the results of its effectiveness and give you a great facial, rid winter dryness facial with it! 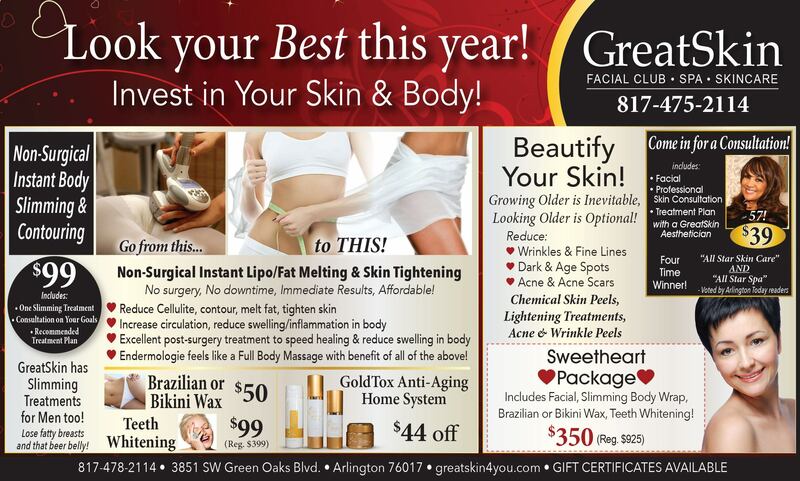 As you know, Great Skin was voted and won Best Skin Care in Arlington, 2014 & 2015 by Arlington Today Magazine and its readers and that was before the launch of GoldTox! Decide you Want to purchase LiquidGoldTox after you see results with your facial treatment using product? Take home Your own supply of LiquidGoldtox & Moisturizer! NEW Hydration Marine Hydration Creame with Moisture ingredients from the Hawaiian Islands infused with Vitamins A, C & E or try any other moisturizer for 50% OFF! Appointment Times Available today for this offer! 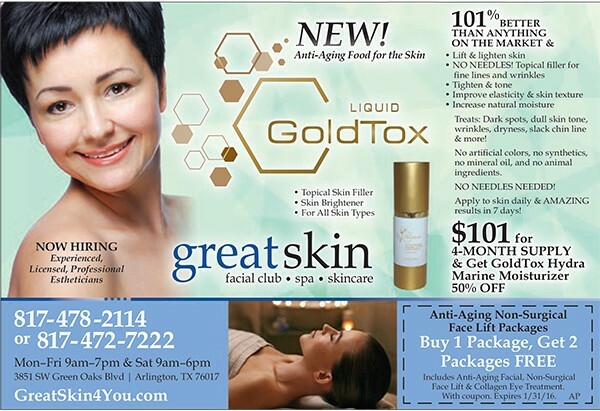 Call and book your appointment now or order your LiquidGoldTox by phone – we will ship it to you! Yes, it can be used by men also! Ask For LiquidGoldTox – Botox Results & Lightening Facial Package! We encourage you take a picture of your face prior to your treatment and then after and share it with all your friends on Facebook, your family or your circle of friends and co-workers! They will tell you how much younger, tighter, brighter and vibrant you skin looks! Then you can share your secret! Also, if you allow us, we will feature your before and after on an upcoming magazine ad and our website! When you listen to your customer’s needs and you care about them and their skin care goals and results, you develop products and services that will help them attain it – effectively, affordably and quickly! That’s the motto of our owner – Brenda Joyce!